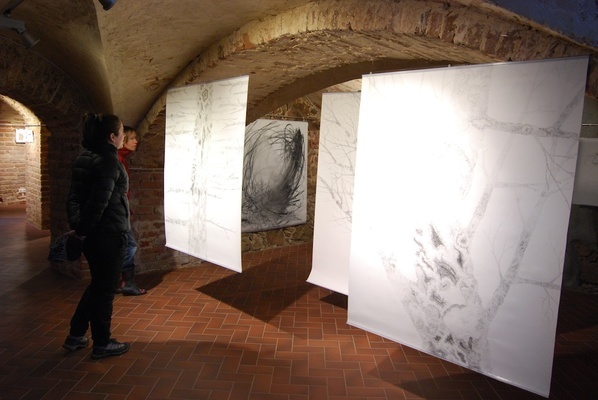 Eku aka Evelyn Müürsepp Grzinich exhibits series of large format drawings. Works on display will present 2 totally opposite approaches on line creation: freehand and uncontrolled (?) from one side, planned and controlled from the other. Maniacally detailed and sensitive works one can watch for long. Eku is visual artist and cultural coordinator, based in Southeast Estonia. After working at artist-in- residencies in Iceland and Finland, she co-initiated artist-in residence program herself in Southeast Estonia (now known as MoKS- Center for Arts and Social practice). While coordinating activities and finding financial and mental means for running artist-in-residence center, she also has maintained her practice as a visual artist. This ongoing life-university has offered her opportunity to learn from artists from all over the world and develop fruitful collaborations in various media. Her main interest and ongoing work is with drawing where she explores how the repetitive movement of a pen/pencil affects the body and its motion. This surface-body-surface feedback is a generative method to shift from abstraction to figural imagery.